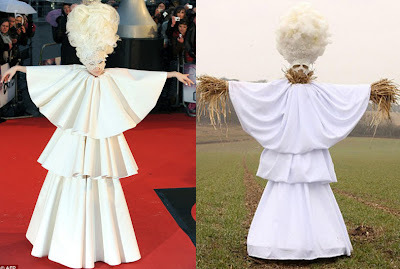 Lady Gaga Scarecrow; Farmer Uses Gaga Replica to Scare Away Birds. Nigel Britten, a farmer in Surrey created a replica of Lady Gaga's famous Brits Awards Red Carpet costume. Not because he is an adoring Gaga fan, but rather because he wanted to keep the pigeons away from his wheat crop. Mr Britten explained "We were laughing at Lady GaGa's outfit and that extraordinary wig and talking about how scary she looked. My fiancee Marti joked that I should make a scarecrow which looked like her. I laughed and then it occurred to me it was actually a very good idea." Well it worked because Lady Gaga has scared away the birds and attracted media attention for Mr. Britten and his farm, that must be great for business. Hmm, we wonder what lady Gaga has to say about this.